A drop in kit with no machining necessary. Out-performs others because these springs are approx 1/2 the weight of dual springs and that raises your RPM limit and takes stress & heat off your motor. Cam flex is reduced and saved HP goes to the rear wheel. The conical shape eliminates the need for an inner spring and allows for a smaller lighter retainer. Longer spring length gives you a better linear rate than shorter springs. 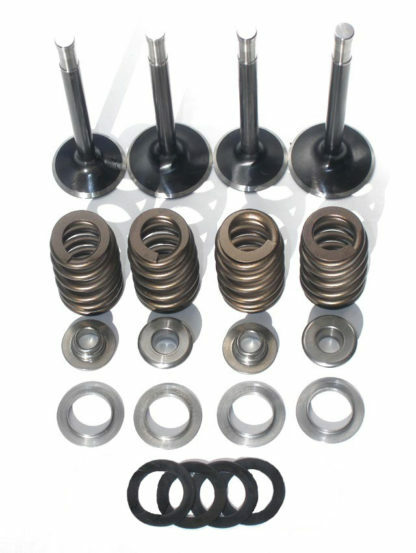 Includes black diamond valves, custom machined stellite tips, beehive springs, titanium spring retainers, spring seats and spring balancing shims. Slightly stronger #2 beehive springs are available for extreme RPM short stroke racing (contact us to special order, same price). See big valves below (more info).